Vi følger Webinar: 2nd World Wide Free Seminar of the Family Dog Project, live! Family Dog Project ble grunnlagt i 1994 for å studere ‘atferder og kognitive aspekter ved hund-menneske relasjon’ (“the behavioral and cognitive aspects of the dog-human relationship”). Forskere, hundeeiere og hunder samarbeider i forskningen. Årets webinar tar for seg etologi (læren om/biologisk studie av dyrs atferd/handlinger), interaksjon mellom hund, menneske og “social robots”, oksytocins effekter på sosial følsomhet, samt biologisk bevegelses-oppfatning hos hund, neste generasjons automatiserte systemer, hunders hukommelse, imitasjon/herming, hvordan snakker vi til hundene våre, hunders forståelse av menneskelig tale, seniorhund, hilseatferd mellom sosialisert ulv og menneske, måling av luktesans og knurring. – “On behalf of the organizing committee of the Family Dog Project, we proudly present our yearly largest public event on canine science – coming directly from researchers to the professionals and dog enthusiasts worldwide. Organized by the MTA-ELTE Comparative Ethology Research Group; the Ethology Department of Eötvös Loránd University; The Hungarian Ethology Foundation & Comparative Behavioural Research Group of the Hungarian Academy of Sciences. Program organisers: Enikő Kubinyi, Péter Pongrácz, Ádám Miklósi. Kilder: Family Dog Project. Family Dog Project Facebook. 17:20-17:35 Krisztina Hegedűs-Kovács: Effects of oxytocin on social sensitivity in two breeds of dogs: a comparison of the Siberian husky and Border collie. 17:35-17:50 József Topál, DSc: The effect of oxytocin on biological motion perception in dogs. 17:55-18:10 Linda Gerencsér, PhD & Bence Ferdinandy: Next generation automated systems: real-time behavior recognition in dogs and wolves. 18:10-18:25 Prof. Ádám Miklósi: Can dogs remember what their owner did? 18:25-18:40 Claudia Fugazza, PhD: Spatial bias in deferred imitation performance – Will your dog go where you go? 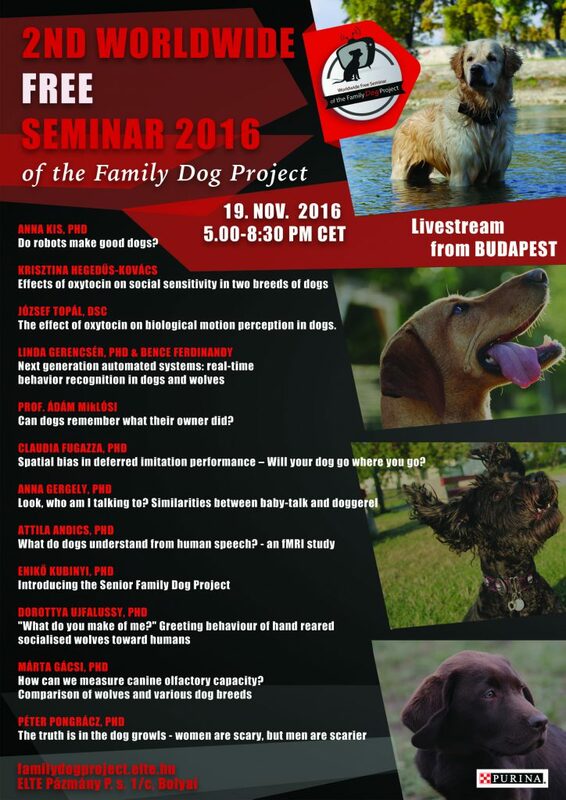 Webinar: 2nd World Wide Free Seminar of the Family Dog Project © http://familydogproject.elte.hu. Kilder: MTA-ELTE Comparative Ethology Research Group; the Ethology Department of Eötvös Loránd University; The Hungarian Ethology Foundation, Family Dog Project, Family Dog Project Facebook, Wikipedia.